It is impossible to see all of the stunning attractions that China has to offer in one trip, but a well-designed tour will afford you the opportunity to discover many of its most celebrated landmarks and follow the fascinating historical timeline that has led to China as we know it today. The culture of the Han ethnic majority originated from Central China and currently plays a dominate role in Chinese communities throughout the world. Yet it is towards the north that we will turn our attention, to the home of Beijing and Xi’an, which are considered the two most important capital cities in Chinese history. Some of the most successful dynasties made these cities their base, and they subsequently flourished as hubs of Chinese culture. Ancient history carries forward to the modern-day, as Beijing remains China’s capital and centre of culture. Similarly Nanjing was not only one of China’s ancient capitals, but also served as the capital of the Republic of China, as evidenced by the Presidential Palace. However capital cities aren’t the only thing on the agenda, as we’ll also visit two areas that were integral to the development and success of China’s culture and economy; Shanxi and Huizhou. After all, you can’t have a capital without capital! 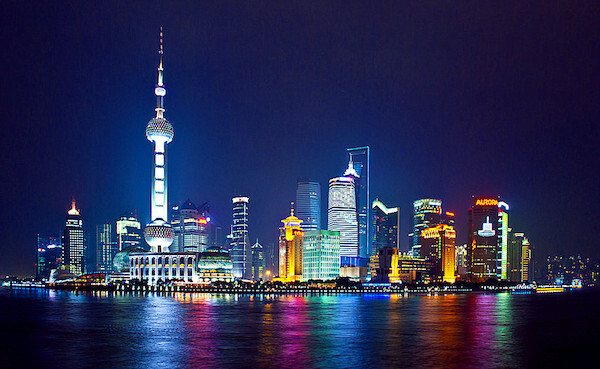 Bringing our tour right up to the modern day, we’ll also be visiting Shanghai, a city in China synonymous with technology, fashion, and keeping ahead of the curve. 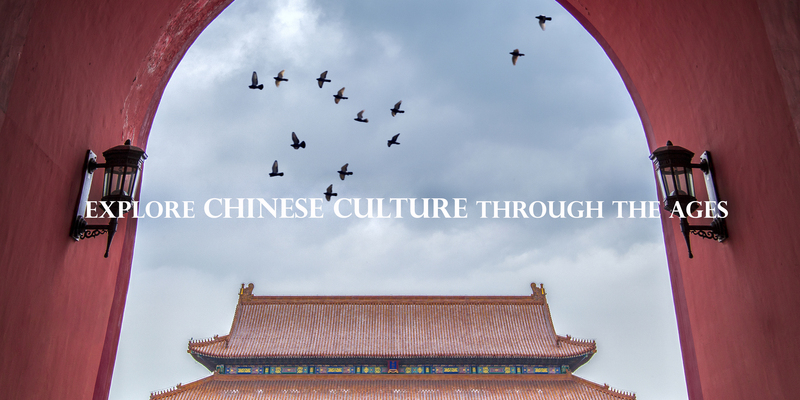 So join us on our tour, where we’ll discover how Chinese culture adapted from imperial times right through to the modern day. And we’ll tackle a couple of the country’s most scenic mountains while we’re at it! 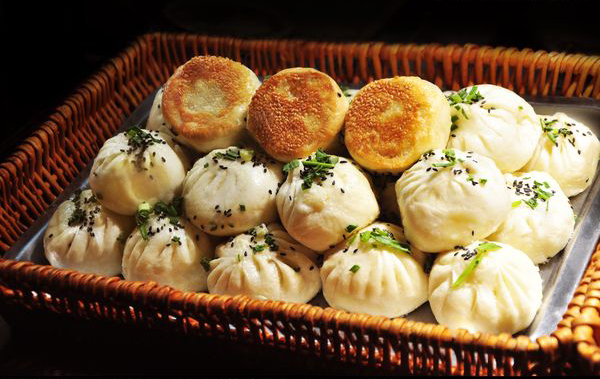 Sample traditional Beijing-style, Shaanxi-style, Anhui-style, and Jiangsu-style cuisine. With its old-fashioned black-tile roofs and simple flagstone streets, Pingyao may seem humble now, but it was once China’s financial centre. The city was built over 2,700 years ago, although it didn’t reach its prominence until it was expanded during the Ming Dynasty (1368-1644). By the Qing Dynasty (1644-1912), it was home to over half of the financial institutions in the whole of China. Residents in Pingyao were so wealthy that they were literally laughing all the way to the bank! Nowadays the city is a popular retreat for tourists and is home to over 300 historic sites, the most famous of which is arguably Rishengchang. This ancient building is thought to have been the first bank ever established in China and, in its heyday, it once controlled half of the silver trade in the country. Its establishment was integral to China’s economic development, so it’s definitely worth investing a little time in it during your visit. After all, it’s sure to generate interest! 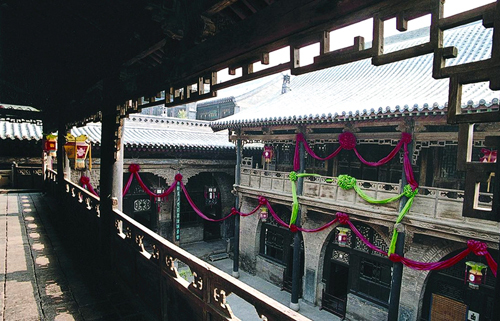 Read more about Pingyao Old Town. This portion of the Great Wall was originally built during the Northern Qi Dynasty (550-557) but, since it protected one of the gates that gave access to Beijing, it was repaired extensively throughout the Ming Dynasty (1368-1644) and is now considered one of the most well-preserved parts of the Great Wall. Its important defensive position meant it was once the site of numerous legendary battles. If only walls could talk, and then we could hear about them first-hand! Thanks to its tough exterior, which is predominantly made of granite, it is considered virtually indestructible and has survived in beautiful condition to this day. Read more about the Great Wall. In ancient times people believed that Huang Di (a King in Chinese legend) had come here to refine his Pills of Immortality. During the Qin Dynasty (221-206 BC), it was known as Mount Yi, but was renamed Mount Huang in 747 AD in honor of the Yellow Emperor. Evidently it wasn’t enough to just make himself immortal, his name had to be immortalized too! Although it is not classed as one of the Five Great Mountains of China, a famous Ming Dynasty (1368-1644) geographer named Xu Xiake once wrote: “It is not worth seeing other mountains if you have been to the Five Great Mountains; and it is not worth seeing the Five Great Mountains if you have been to Mount Huang”. We’ll be visiting both Mount Huang and one of the Five Great Mountains on our trip, so feel free to put Xu Xiake’s words to the test! Read more about Mont Huang. 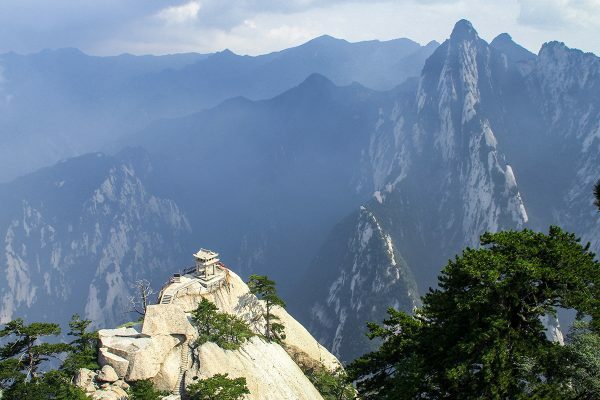 Listed as one of the Five Great Mountains of China, Mount Hua has a pretty big reputation to live up to. Standing at an altitude of just 2,100 metres (7,070 ft.), it is nowhere near as tall as several of the other mountains in the country. Yet it is its spiritual significance that has earned it such fame and, once you set foot on one of the many mountain paths, its mystical quality is palpable. Taoists believe that the god of the underworld lives inside the mountain and historically it has been a site of pilgrimage for monks of various religions. 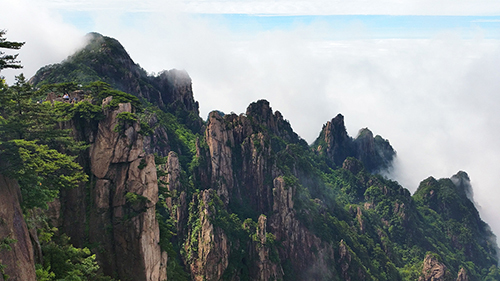 From Immortal’s Palm Peak, where the deity Juling reputedly descended from heaven and tore the mountains in half, to the Jade Spring Temple, where the Golden Fairy Princess supposedly lost her jade hair clasp, this mountain range practically exudes spirituality. Only the hardiest of hermits, with the strongest wills and most spiritual of natures, were believed to be able to conquer the mountain, so don’t be too disappointed if you end up having to use the cable car! Read more about Mount Hua. The beauty of Beijing’s hutongs is indefinable and, rather fittingly, there is no exact definition for the word “hutong”. The term is commonly used to refer to ancient streets and districts in Beijing that have remained largely unchanged. There is even an old Chinese saying in the city which states: “There are 360 hutongs that are named, but the hutongs without names are as plentiful as blackberries”. This may be something of an exaggeration but, like blackberries, hutongs are one of the sweetest parts of Beijing! Many of them date back further than 800 years and act as a sort of time capsule, connecting this modern city with its ancient past. 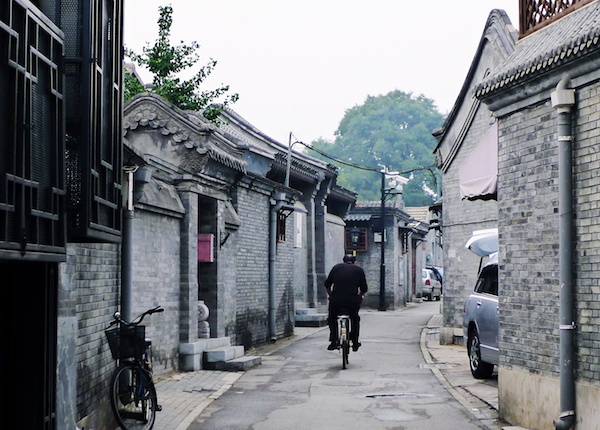 Yet, unlike many of Beijing’s illustrious historical sites, people still inhabit the hutongs and perpetuate a way of life that has long since been forgotten by the city’s urbanites. Walking down one of these ancient passageways and feeling the well-worn flagstones beneath your feet, with the trees rustling above you and the muffled cries of vendors in the distance, you’ll be thankful that this peaceful slice of history still exists. Read more about The Hutongs of Beijing. The Bund has become something of an emblem for the city of Shanghai and is widely considered to be its most well-known tourist attraction. The term “bund” derives from the Persian word “band”, which means embankment or levee, and is a testament to the city’s cosmopolitan nature. As a harbor city, Shanghai has seen more foreign merchants, visitors, and residents over the years than some Chinese cities will see in their lifetime. The numerous banks, trading houses, hotels, and consulates that line the Bund were built in the colonial architectural style and make for a stark contrast compared to the more traditional Chinese buildings found in cities like Beijing. The Bund itself centres on a section of Zhongshan Road, which rests on the western bank of the Huangpu River and directly faces the towering forest of skyscrapers in the Pudong District. This futuristic scenery is a far-cry from the delicate eaves of the Forbidden City or the ancient majesty of the Terracotta Army, yet it has still managed to enchant visitors for decades. With its rippling waters, international vibe, and fascinating blend of architectural styles, it serves as the perfect symbol for modern China. Read more about the Bund of Shanghai. 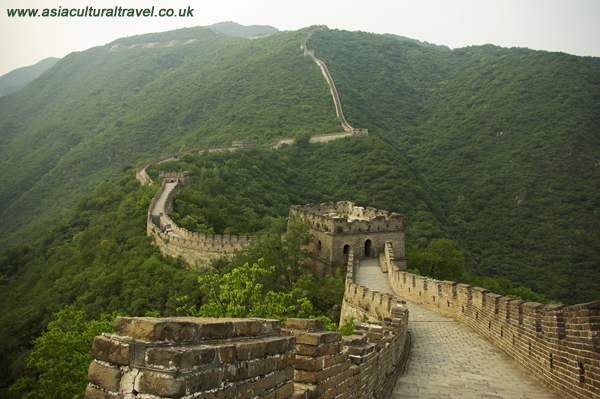 Nowadays it’s earned great fame as the starting point of the Silk Road and the site of the legendary Terracotta Army. Yet Xi’an has a few more surprises up its sleeve! Its Muslim Quarter is home to the Hui ethnic minority, whose unusual culture and delicious cuisine have delighted locals and visitors for years. 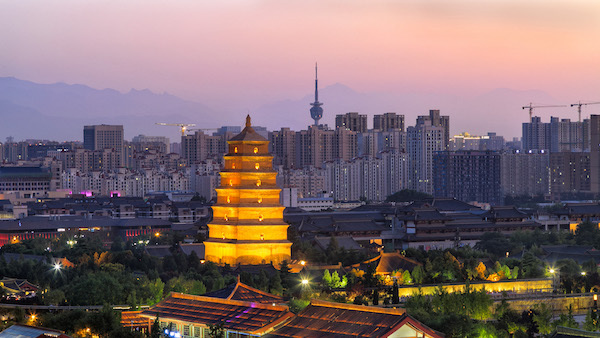 From the Great Wild Goose Pagoda and the Da Ci’en Temple to the Bell Tower and the Great Mosque, Xi’an boasts so many wonderful attractions that a lifetime may not be enough to discover them all! Read more about Xi'an. 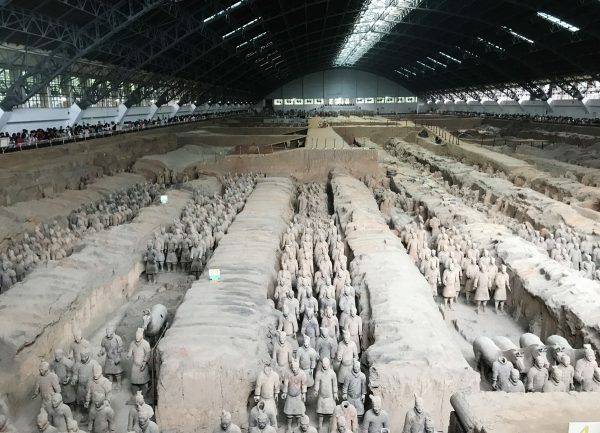 The legendary Terracotta Army has captivated audiences across the globe ever since they were discovered in 1974. In fact, when the British Museum held an exhibition of just a small selection of real figures from the excavation site, it resulted in the most successful year they had had since the King Tutankhamen exhibition in 1972. So if the opportunity to see just a few of these magnificent statues was enough to send the British public into a frenzy, imagine seeing over 6,000 of them arranged in their original military formation! Emperor Qin Shi Huang, the first emperor of China and founder of the Qin Dynasty (221-206 BC), began building his mausoleum in 246 BC at the tender age of just thirteen. Talk about starting them young! This colossal necropolis took 11 years and over 700,000 laborers to complete, and perhaps its most exceptional feature is the Terracotta Army. Boasting approximately 8,000 soldiers, 130 chariots with 520 horses, and 150 cavalry horses, this army is impressive enough in of itself, but what makes it so fantastically unique is that every single soldier is different. From their height and hairstyle to their uniform and facial features, each figure is unlike the one before it. 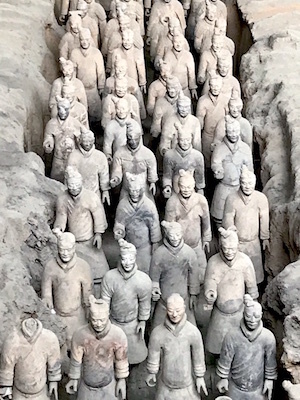 Read more about The Terracotta Army. 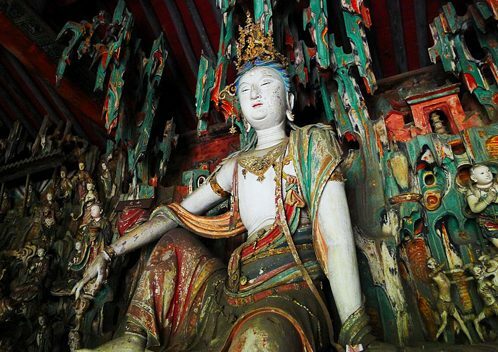 Shuanglin Temple has been nicknamed “The Museum of Coloured Sculptures” and, when you set foot inside and marvel at the collection of over 2,000 painted statues that decorate its halls, you’ll soon see why! 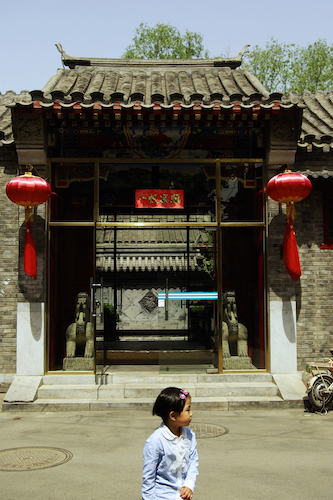 Currently, due to lack of historical documents, researchers do not know exactly when the temple was built, but a stone tablet stating it was rebuilt in 571 AD during the Northern Qi Dynasty (550-577) and two huge locust trees that were planted during the Tang Dynasty (618-907) attest to its ancient origins. Although it is estimated that the temple is about 1,400 years old, it underwent large scale restoration throughout the Ming (1368-1644) and Qing (1644-1912) dynasties and so its appearance reflects those architectural styles. After all, when you’re over 1,000 years old, you need a little extra help to keep looking good! Its name literally means “two woods” and makes reference to one of Buddha’s teachings, which states that “nirvana is between two trees”. Buddha may not have specified which two trees they were, but Shuanglin Temple’s peaceful atmosphere is sure to make you feel more enlightened. 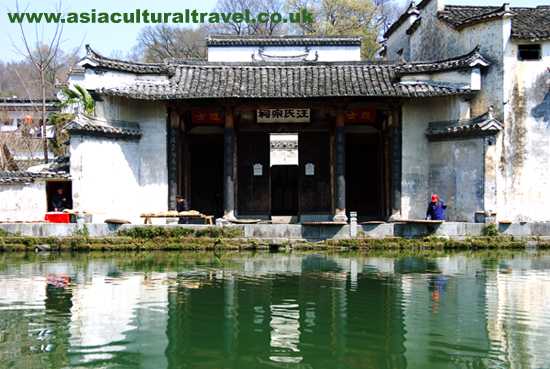 Read more about the Shuanglin Temple. Construction of this colossal palace began during the early 15th century and was masterminded by the Yongle Emperor of the Ming Dynasty (1368-1644). It took over 100,000 artisans and one million laborers 14 years to complete and was home to 24 successive emperors over a period of 491 years. This means that, for every year it took to build, it got over 35 years of use. Talk about getting your money’s worth! Since each emperor believed himself to be the son of heaven, the palace was built to imitate the legendary Purple Palace of the Jade Emperor (the King of Heaven). This is why it’s occasionally referred to as the Purple Forbidden City and why it originally had 9,999.5 rooms, as the Purple Palace supposedly had 10,000 rooms and it was considered improper for the Emperor to try and outdo his father! Nowadays the palace’s smooth red walls, yellow glazed-tiles roofs, and intricate decoration have become a symbol of Beijing and one of the most recognizable relics of imperial China. 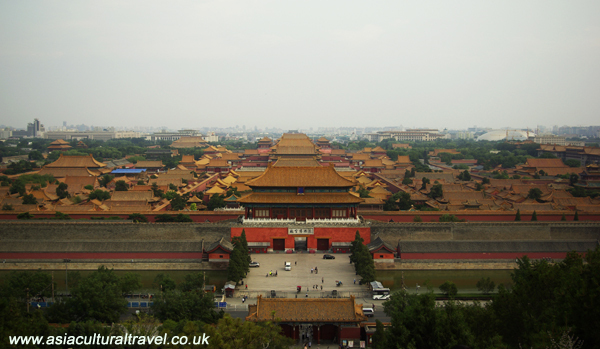 Read more about The Forbidden City. 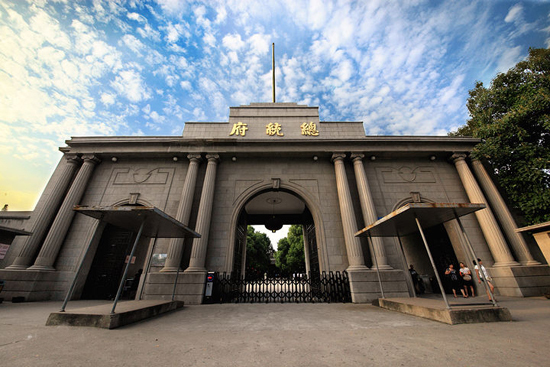 The Presidential Palace is one of the more unusual tourist attractions in Nanjing, as its history spans both imperial and modern China. This has resulted in a hectic mixture of traditional dynastic and contemporary architectural styles, with a post-colonial flair added in for good measure! The palace was originally established during the early Ming Dynasty (1368-1644) and was used primarily by royal princes. During the Qing Dynasty (1644-1912), it became the Office for the Viceroy of Liangjiang, a government official charged with the administration of modern-day Jiangsu, Anhui, and Jiangxi provinces. Most people are lucky enough to upgrade from a cubicle to their own office, let alone an entire palace! Yet its period of greatest fame came after the collapse of imperial rule in 1912, when Sun Yat-sen decided to keep offices there. From 1927 onwards, it was the main headquarters of the Chinese Nationalist Party until their leader, Chiang Kai-shek, fled to Taiwan in 1949. Nowadays it is known as the China Modern History Museum and serves as one of the last remnants of the Republic of China, being one of the only places where the Flag of the Republic of China can be legally displayed. Read more about the Presidential Palace. Shanxi Grand Compounds were colossal mansions masterminded by wealthy merchants during the Ming (1368-1644) and Qing (1644-1912) dynasties. These bizarre castle-like structures were built according to the architectural style of northern China and feature many small courtyards that were in turn surrounded by high walls for defensive purposes. The layout of each compound is symbolic and has a deeper meaning based on the wishes and desires of the family who built it. For example, the Wang Family Compound is made up of five main courtyards, which were designed to represent the five lucky animals in Chinese mythology: the dragon, the phoenix, the tortoise, the qilin (Chinese unicorn), and the tiger. It was believed that these animals would watch over the family, protect them from misfortune, and bring them good luck. Being the largest grand compound in the whole of Shanxi, you could almost say it’s a real beast to get around! 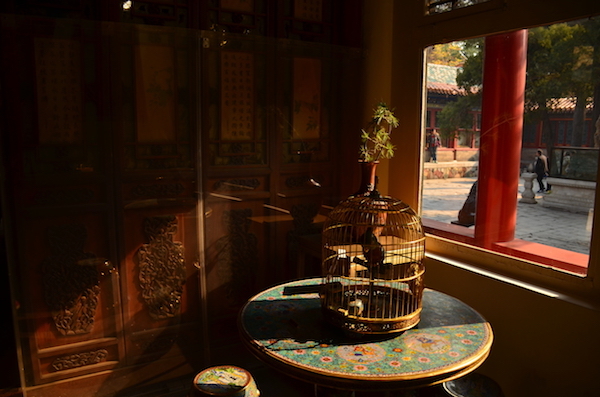 Nowadays over 100 of the smaller courtyards and 1,000 rooms are open to the public, giving visitors an insight into the lavish lifestyle of the rich and famous in ancient China. Read more about Shanxi Grand Compounds. Like the merchants of Shanxi, traders from the ancient region of Huizhou began to thrive financially during the Song Dynasty (960-1279) and swiftly found themselves with more money than you could shake an ink stick at! Unfortunately the size and majesty of residential buildings was largely dictated not by wealth but by social status and, since merchants were considered of a low social standing, they were not permitted to own the kind of grand dwellings that were afforded to government officials or aristocratic families. Yet the wily Hui merchants weren’t about to let this stop them, so they found a way to show off their immense wealth without breaking social etiquette. Instead of focusing on size, they turned their attention to decoration and adorned their mansions with the finest brick-sculptures, woodcuttings, and stone carvings money could buy. From the doors to the roofs, Hui mansions are a true work of art. Many of these ancient buildings date back to the Ming (1368-1644) and Qing (1644-1912) dynasties and are still in excellent condition, serving as proof that money doesn’t just talk, it speaks beautifully! Read more about Hui Architecture. The locals consider this temple so integral to the history of Shanghai that there is even an old saying which states, “Anyone who fails to see the City God Temple, fails to see Shanghai”. So, if you’re braving that long flight to China and stopping off in the city, you surely don’t want to be accused of missing out! The temple is located in the ancient, walled part of the city and the name “City God Temple” is used to describe not only the temple complex, but also the surrounding commercial district. The term “City God” refers to specific immortals or deities who were believed to protect certain cities, and Shanghai happens to have three of them. Evidently it is true what they say; three really is the magic number! The temple was originally known as the Jinshan or “Golden Mountain” Temple but was converted into the City God Temple in 1403, during the Ming Dynasty (1368-1644). It enjoyed a surge of popularity during the Qing Dynasty (1644-1912) and, eager to take advantage of this new business opportunity, hundreds of vendors set up shop in the surrounding streets, which swiftly became a busy marketplace. Many of these old stores have maintained their original characteristics and are over a hundred years old. After all, if your business strategy has worked for that long, why change it! Read more about Shanghai's City God Temple Distrcit. Dinner: Welcome dinner of traditional Beijing-style cuisine. We will spend the morning exploring the colossal Forbidden City. Then we will scale the highest hill in Jingshan Park so that we can enjoy a panoramic view of the Forbidden City and Beijing City. 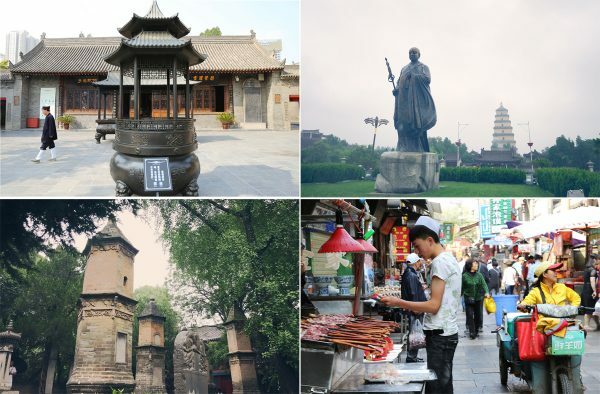 In the afternoon, we will take you to the heart of Old Beijing, the Hutong district, where we can admire the old dwellings and imagine what life was like in ancient China. Dinner: Not included. Throughout the tour, we will recommend several signature dishes and notable local restaurants, but you are free to choose where you would like to eat. We will be taken to Mutianyu by private car. It is time to see whether you are up to the challenge! Are you strong enough to finish climbing this entire portion of the Great Wall? If you fancy a more leisurely ascent, you can always buy a ticket for the cable car. After all, you are on holiday! Dinner: Not included. Guests are free to explore the area and sample the local food themselves. Please feel free to ask us for any help. We will take the high speed train to Taiyuan, the provincial capital of Shanxi Province, first thing in the morning, and then we will transfer trains to Pingyao after lunch. We should arrive in Pingyao at around about 1.30pm, which gives us the whole afternoon to explore this scenic ancient town. We will be driven by private mini coach to visit these two amazing attractions. 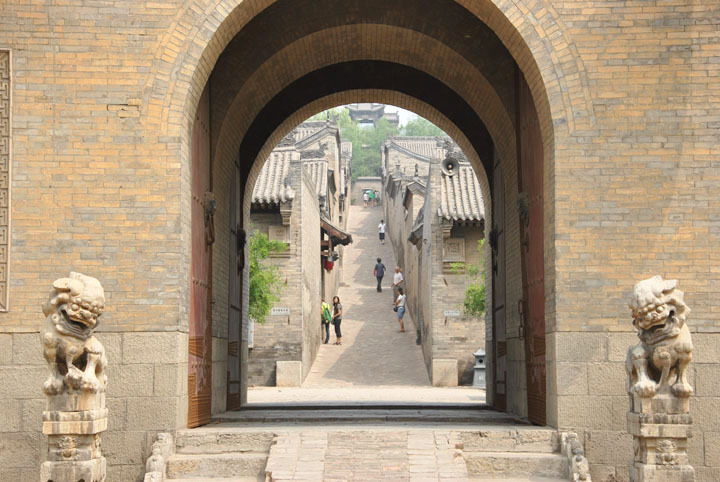 Once we have returned to Pingyao, you can climb a part of the City Wall and enjoy the panoramic view of the whole town and the alien landscape of the Loess Plateau. If there is not enough time to properly enjoy the view, we will move this activity to the next day. We’ve dedicated the whole day to exploring this old town and visiting all of the attractions it has to offer on a guided tour. Once the tour has ended, you’re free to wander around the town and discover parts of it yourself, or simply revisit the places you liked best! We will take the high-speed train to Taiyuan in the morning, and then board our flight to Xi’an. We should arrive in Xi’an sometime in the early afternoon. After we’ve settled and checked in at our hotel, we will go to the Giant Wild Goose Pagoda and the Muslim district, which is also the centre of the old town. Dinner: Not included. We recommend you try one of the many small restaurants along Muslim Street, where you can sample the cuisine of the Hui ethnic minority. Please feel free to ask us for any help. In the morning, we will take a bus to visit this world-renowned attraction and will spend most of the day there, leaving only in the late afternoon. 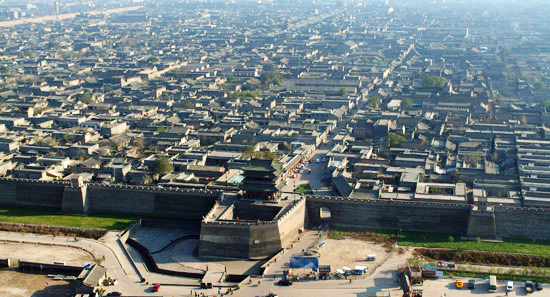 Once we’ve returned to Xi’an, we’ll climb the ancient city walls and enjoy a panoramic view of the city. In the morning, we will travel to Mount Hua via train. Unfortunately you may not have enough time to explore the entirety of the mountain range, unless you have limitless energy that is! 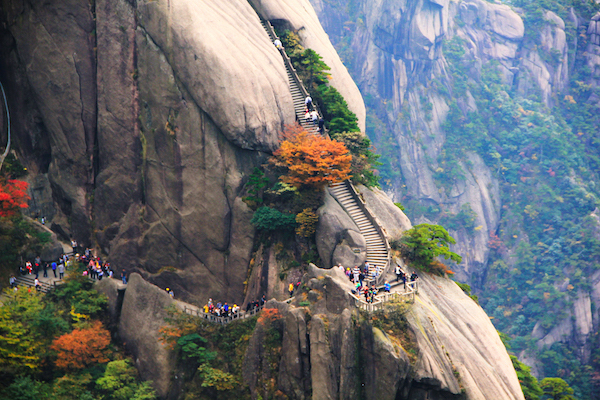 After all, it is one of the largest mountain ranges in China and some of the hiking paths that lead to the peaks are quite difficult. Alternatively you can choose to ride the cable car, which cuts out some of the fun of climbing but will save you a lot of time and energy. We’ll spend the morning bidding farewell to the beautiful old town of Xi’an, and then board our flight to Huangshan just after lunch. We should arrive in Huangshan at around about 3.30pm. Then we will head to Tunxi Old Town, which boasts a multitude of ancient buildings that follow the Hui-style of architecture. Dinner: Not included. 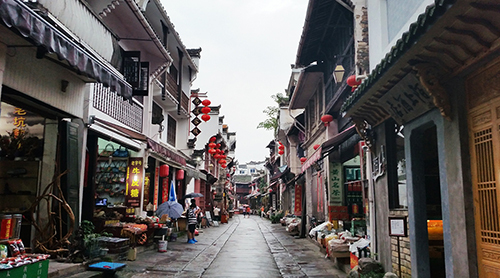 The residents in Tunxi are incredibly friendly so searching for restaurants in the old town is a fun way to engage in local life. Please feel free to ask us for any help. We will spend the whole day learning about and enjoying traditional Huizhou culture in Chengkan, surrounded by fragrant tea fields and verdant mountains. After dinner, we will check in to a hotel at the base of Mount Huang in preparation for our hike up one of the most beautiful mountains in China. After a leisurely day spent hiking up the magnificent Mount Huang, we’ll be rewarded with a stunning panoramic view from its peak. In the morning, we will take the train from Huangshan to Nanjing. 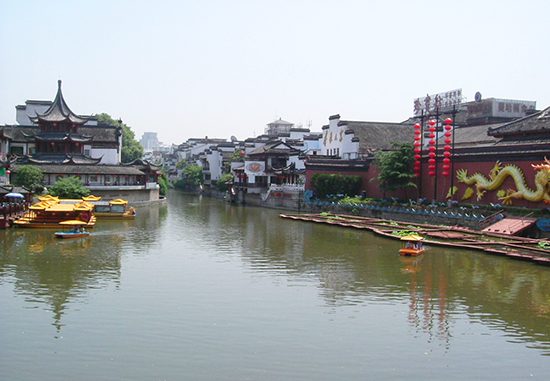 In the afternoon, we will visit Fuzimiao District and Qinhuai River District, which is where we’ll find the centre of Nanjing and several historical remnants of the city’s prosperous past. This palace serves as a powerful reminder that, had the Chinese Nationalist Party won the civil war, Nanjing would have surely become the modern-day capital of China. Since the CNP were deeply influenced by Western cultures, you’ll notice that the architecture of the palace has a certain Western flair. In the afternoon, we will take the high-speed train to Shanghai. 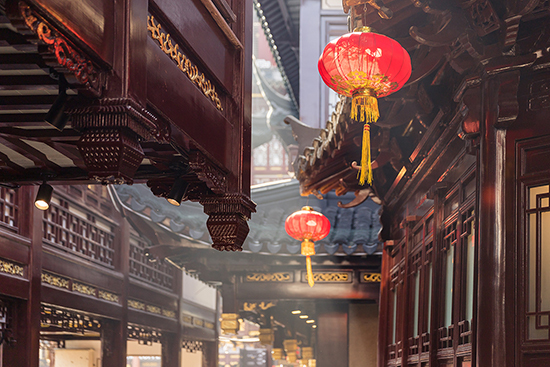 To follow the history of the city chronologically, we’ll visit the City God Temple area first, followed by the Bund. This forest of modern skyscrapers is a far-cry from the ancient buildings we’ve admired so far on our journey. On your final day with us, you can either choose to embark on your return journey home or continue your travels. If you decide to continue traveling, we’ll be on hand to help you book any travel tickets or hotels should you need us to. If you need any recommendations on where to travel, please do not hesitate to ask us. Please Note: You can choose to stick to this tour entirely, or you can just incorporate it as part of your wider plans to travel across China. We can provide you with information and help you with any other travel plans you may have if you need us to. We also provide a hotel booking service and a flight or train booking service for all of our members’ traveling in China outside of the 15 designated days of the tour. We will also provide a consultancy service for you, which will help you to plan your journey across China and give you useful tips on traveling in China. We hope that you will have a wonderful time traveling with us! Including: 14 nights of accommodation; all entrance fees to the attractions mentioned in the itinerary; 6 dinners; all breakfasts; all transportation fees during designated tour times; an English speaking guide; a pdf file with useful information about Chinese history. Accommodation: Unless there isn’t one available, we will stay in 4-star hotels in the major cities. Should one not be available for any reason, we will stay in at least a 3-star hotel or the best local hotel. 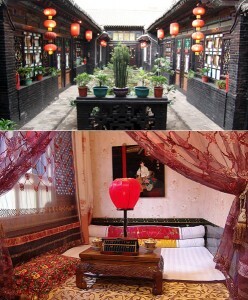 When we visit Pingyao Old Town and Tunxi Old Town, we will stay in a traditional courtyard hotel. Please Note: In the Pingyao courtyard hotels we might be sleeping on traditional Chinese heated brick beds. Depending on the number of participants, hotel rooms may be shared by up to three people. Food: Breakfast will be provided every day and we will also provide 6 dinners consisting of local cuisine in each city. You will notice in the itinerary that we have a well-designed dinner plan, and you will always be offered a local dinner on the first day in each new city. Aside from this, you are welcome to explore the local restaurants and sample the signature dishes by yourself, although we will always be on hand to translate for you and help you order. Transportation: The cost of the flight from Taiyuan to Xi’an and from Xi’an to Huangshan; the high-speed train tickets from Beijing to Taiyuan, Taiyuan to Pingyao (return ticket), Xi'an to Huashan (return tickets) and Nanjing to Shanghai; the normal train ticket from Huangshan to Nanjing; and the hired car we will use to visit attractions are all included.